The littoral surrounding the Bay of Bengal (BoB) is arguably one of the most complex regions in the world, comprising of a diverse range of economic, political and social cultures that has created a mix of idiosyncratic opportunities and risks in each state. The relations that these nations maintain with each other affect their development – or lack thereof – at a time when interdependencies are increasing in the region and beyond (Cordesman & Toukan 2014). Much like Central Asia, a multi-vector “Great Game” in the South Asian region includes numerous processes such as the US’ re-balancing, China’s assertiveness, Russia’s re-entry as a global power, Japan’s quest for economic revival, India’s Look East policy, politics of energy security, and so on. With the evolution and intensification of these processes, the regional security in the BoB and the socioeconomic conditions are being profoundly transformed. As the U.S., China and India adopt a macro approach, littoral nations seek ways to pursue their own development, essentially through infrastructure development, decreasing small nation dependencies, and creating new partnerships. Additionally, the existence of a competitive environment is a determining factor in promoting regional integration. As we can see for the littoral nations, beside the three major powers involved in the Bay, other nations like Japan and Russia are also taking advantage of this competition to make their way into the BoB through the littorals. 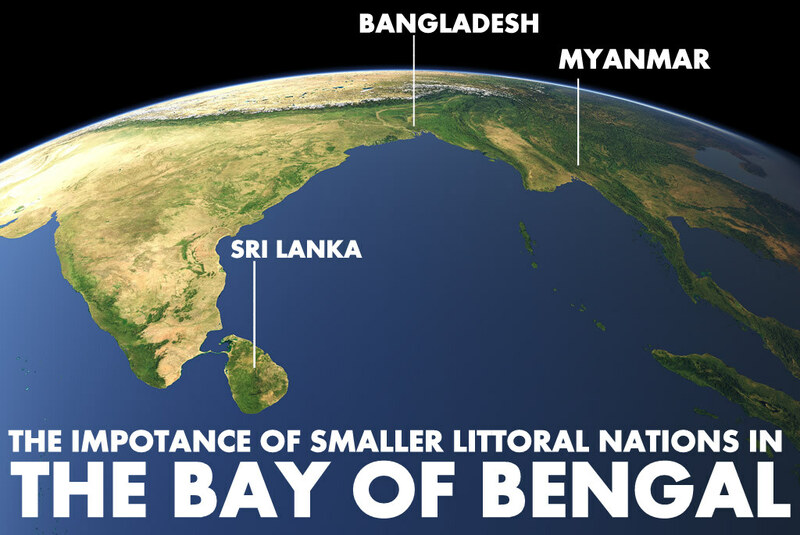 Bangladesh and Myanmar are crucial entry points to non-littoral states in the BoB such as India’s Seven Sisters, China, and Japan. These countries need the Bay for their internal development, their connectivity to the rest of the region and for strategic purposes. In this regard, Bangladesh and Myanmar are headed to become bridges between South and Southeast Asia. These new strategic opportunities are pushing these nations to modernize their infrastructure, increase connectivity and bank on their strategic geographic location. Following are some of the important investment and strategic partnerships that reflect the nature of the relationships between the littorals and the major powers in the BoB region. Delhi and Colombo enjoy a strong trade and investment relationship; the latter is India’s largest trading partner in South Asia and India is Sri Lanka’s largest trading partner globally. In addition, Colombo is one of the largest recipients of development credit by the Indian Government, which mostly comes in the form of disaster-relief and infrastructure building. The two neighbours are also enhancing their defence relationship through extensive training (Government of India 2014). Sri Lanka also shares robust ties with China; the latter is its largest source of Foreign Direct Investment (FDI). China has also provided development loans for projects such as the new Colombo Port Terminal, Hambantota Port, and a four-lane expressway among others. These investments have played a pivotal role in accelerating Sri Lanka’s development in the region. In return, the country recently agreed to join China’s ambitious Maritime Silk Route project, which reflects a strategic partnership both will benefit from. For China, access to Hambantota is essential for its new strategic, connectivity and economic aspirations; for Sri Lanka, this can be an opportunity to become an important player in the development of BoB trading ports (Goodman 2014). After the end of civil war in 2009, Sri Lanka has emerged as a willing and capable partner in effectively combating violent extremism, trafficking and piracy, thereby helping to ensure the maritime security of the region. In this regard the US’ anti-extremism approach has opened up avenues for cooperation. As both China and India will continue to engage extensively with Colombo, Washington has interest in having closer security ties, as in the other littoral nations. If we look at Myanmar, the new government has been approving projects that had been sitting idle for years (Economist 2014). This dynamic regional context has allowed Nay Pyi Taw to deal with a plethora of new partners competing to enter its resource-rich market. The country has been leapfrogging since its recent reforms and experiencing unprecedented FDI growth since 2009. Nay Pyi Taw holds great strategic importance for China due to its energy endowments. The pipelines through Myanmar have the potential to help China reduce its heavy dependence on the Strait of Malacca for the transportation of energy. This, of course, has strategic implications against the backdrop of the United States’ rebalancing in Asia and the on-going maritime disputes in the SCS. The successful building of the pipelines through Myanmar could reduce China’s dependence on the Strait of Malacca by 30% (Melkulangara 2013). Japan is similarly showing interest in Myanmar. During a recent visit, the Japanese Premier agreed to cancel the $1.74 billion debt owed by the country to Japan, but also pledged to lend Myanmar more than half a billion dollars for infrastructure and power projects in the country (Song 2013). Japan is also developing the Thilawa Special Economic Zone in Thanhlyn-Kyauktan area of suburban Yangon. The multi-million project includes building a seaport, roads and other infrastructural development programmes (Asia News Network 2013). In terms of security, both India and China have been strengthening their military cooperation with Myanmar. Over the years, Myanmar has gotten military equipment supplies from China and received training for officers from both India and China. The country is trying to balance its dependence on China by exploring its other strategic partnership options (Yhome 2014). Russia is another player asserting its presence in Myanmar. Russian Foreign Minister Sergey Lavrov, in his visit to Myanmar, called for the complete dismantling of sanctions against the country. It would not be surprising to see Russia making offers to build a nuclear power plant in Myanmar or engaging in weapons trade (Melkulangara 2013). For India, Bangladesh’s significance for the access to its Seven Sister’s cannot be underestimated. Access through the country can be a key to the development of the Northeast of India as it could access the sea to connect to larger markets for its products. Economically, both countries share a strong and significant trade relationship despite a considerable trade deficit in favor of India. India has also provided the country with lines of credit for large infrastructure projects. However, the arrival of China as a competing power in the region has also given Bangladesh some leeway and has had a balancing effect in terms of the country’s protracted dependency on India. As for China, the same strategy it uses in Sri Lanka applies to Bangladesh. Strategically, access to ports in Bangladesh can facilitate Beijing’s oversight of its SLOCs and be a key geographical location for its envisaged Maritime Silk Route. For the past four decades, China’s contribution to Bangladesh’s development in the form of economic aid, military assistance and infrastructure development has been significant. More recently the emphasis is being put on infrastructural development, which is largely benefiting Bangladesh and China for strategic purposes such as greater connectivity to China’s Yunnan province. Like China, Japan has also been trying to make its way into the BoB through Bangladesh. Economically and strategically, Japan has been increasing its influence in the littoral nations and showing greater interest in the region. Tokyo’s new strategy may have been adopted due to the country’s economic issues and the security environment in East Asia (the China factor), making the nation turn toward South Asia (Bangladesh and Myanmar). This move could also allow Japan to find alternative markets for goods and investment and alternative locations for production. 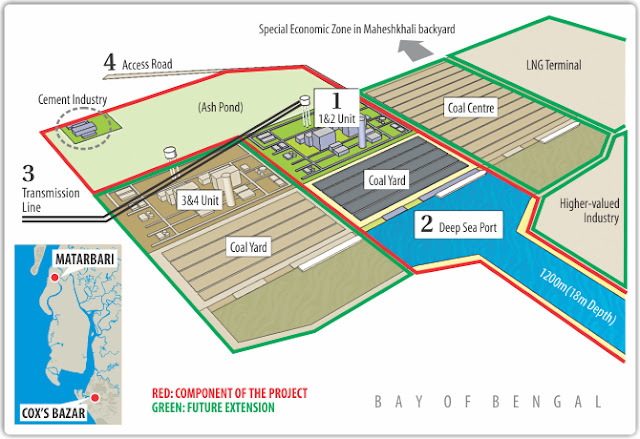 Among other projects, the Bay of Bengal Industrial Growth Belt (BIG-B) plan is a strategic initiative proposed by the Japanese Prime Minister, Shinzo Abe, which aims to promote industrial agglomeration along the Dhaka-Chittagong-Cox’s Bazaar belt, and enhance economic ties stretching from the Pacific to the Indian Ocean (Daily Star 2014). The initiative would comprise three pillars. The first pillar is industry and trade; this would mainly consist of constructing the long-awaited deep-sea port on Matarbari Island, which would offer Bangladesh an important trade gateway to the rest of Asia and beyond. The second pillar is energy, the Matarbari Island has the potential to be developed into a massive supply base of primary energy such as coal, LNG, and oil. The electricity harnessed from those sources could catalyse development in industry and trade. The final pillar is transportation, which would enable greater industry, trade and energy production between Japan and Bangladesh. The initiative, approved in August 2014, will also allow Bangladesh to provide a gateway to the BoB, boost regional economics, and play a central role in strengthening the nexus between Southeast Asia and South Asia (Bhatnagar 2013). The US and Bangladesh established a bilateral security dialogue in April 2012, through which the US is providing assistance to the Bangladesh Navy in counter-terrorism and maritime interdictions. This US-Bangladesh bilateral defence relationship is currently one of the most robust in South Asia. Moscow is set to be a strong competitor to Washington in its aspiration of getting a foothold on Bangladesh’s energy reserves. The focus of the recent visit of Prime Minister Sheikh Hasina to Moscow (which was the first visit by a Bangladeshi Prime Minister in 40 years) was on energy and arms purchase. Russia is investing heavily to finance its arms exports, as well as to build the first nuclear reactor in Bangladesh (Bhadrakumar 2013). 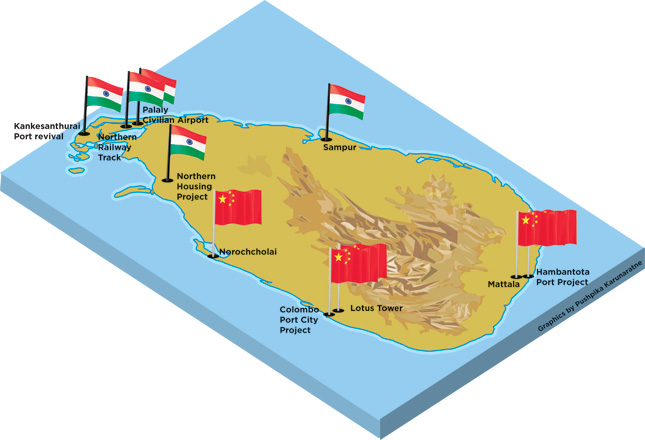 China is arguably exerting the most influence on the littoral nations. The strategy of “China finances and builds transportation routes leading to its hinterland and connects them to the upstream projects in neighbouring regions” has become very familiar to Asian nations. China’s financial strategy includes FDI, aid, assistance and loans. 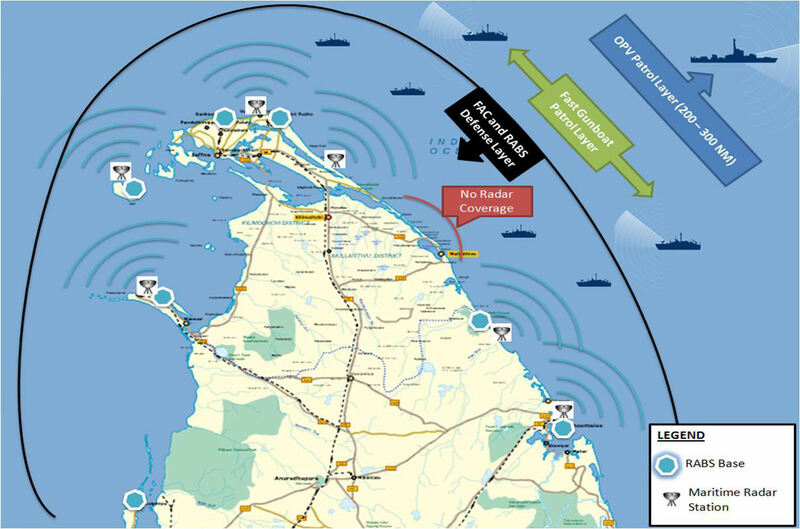 Littoral nations invest in cooperation and partnerships as they are all trying to balance out their dependencies on one single power and diversify their partnerships. Amid the strategic competition between the major powers, Bangladesh, Myanmar and Sri Lanka appear to have adopted an equidistant approach in managing their relationships with these actors. At the same time, the littorals are attempting to leverage their geo-strategic location in the BoB by using the competition to their advantage and giving equal priority to their engagements with the major powers (Sakhuja 2010). In this context, the perceived spectre of India-China or China-US rivalry does not loom large. What gives the smaller littorals a bargaining chip is their significance and role in the realization of the major powers’ larger strategic ambitions. To a certain extent, all the littorals can either facilitate connectivity and contribute to energy security or provide larger markets for trade to the major regional players. In return, these nations are benefiting from infrastructure development, financial assistance, integration, military modernization, etc. So far, the partnership between major powers and smaller littorals based on soft power has added stability to the security environment of the BoB. Amamah Ahmad is a Research Associate at the Bangladesh Enterprise Institute in Dhaka, Bangladesh. She graduated with a Bachelor of Arts in Social Science and a Master of Arts in Political Science from the University of Lausanne in Switzerland. She has research interests in Geopolitics, International Security and Trans-boundary issues.